Many Cape Town Startups have come an gone over the years. Some sold while others folded or flipped. One thing is for sure: Cape Town is the Startup captial of South Africa. A recent project brought to us by the local media Goliath 24.com (the same people who are sponsoring this post) is MappedinCT. Mapped In Cape Town is a visual snapshot of the Cape Town startup ecosystem. It follows the law of density: the denser the map, the better the ecosystem. Add your company. Make connections. Grow the ecosystem. 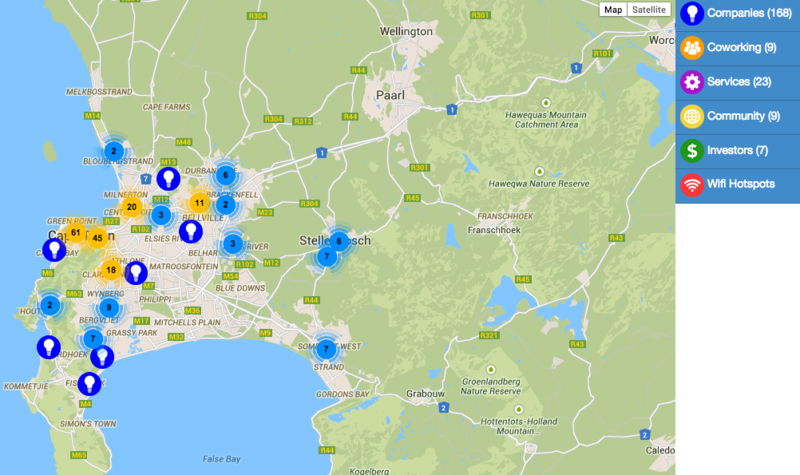 Currently the startup map of Cape Town only lists 168 companies but this is sure to grow cos like blogging a few years back almost everyone is involved in the tech startup eco-system these days. What does this mean for Cape Town? Jobs, Jobs & more jobs for those with experience in digital. Innovation is now (has always been) right on our doorstep from the West Coast, in the CBD & to False Bay. You are not alone. Just look at how many other startups reside in Cape Town. How easy will it be to find collaboration opportunities? Go on, list your startup. It doesn’t cost anything and maybe it’ll lead to and unexpected surprise. If everyone involved in start-ups list their the map will be filled with blue.